The term surface water includes the rivers, streams, ponds, and lakes of Maryland, Delaware, and D.C. Data about these resources are available in either real-time or monthly. Current streamflow information maps are listed by county with 5 year information. This information is based on readings from streamflow gages monitored by the MD-DE-DC Water Science Center. Click here to view detailed streamflow information by site location. 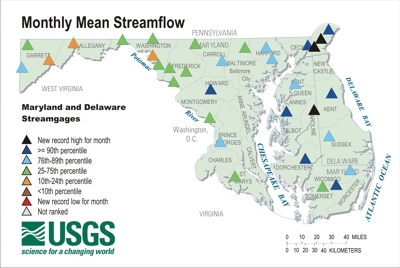 Click here to view a summary of the Chesapeake Bay monthly streamflow conditions.